The Knicks' first-round pick just wants to be healthy by the regular season. 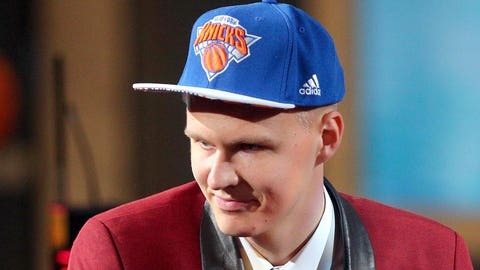 Porzingis has only played two preseason games so far, missing the third one with this injury. He struggled during the first half of the initial contest against Bauru, a Brazilian team, but bounced back nicely with a more comfortable third and fourth quarters. He was obviously nervous to play his first NBA game and even admitted such after festivities were over. By game two, KP looked much better. He pulled down 10 boards, scored nine points against the Wizards. He showed off moves, too. He caught a ball on the perimeter, ball faked, went one dribble and then sunk a pull-up 14-footer. (He's 7-foot-3, by the by.) He hit a shot from beyond the arc. He had some solid hustle offensive boards—even if his rebounding abilities are still solidly lacking. Missing the end of the preseason is rarely ever a big deal, but for a rookie looking to find his comfort zone, it could have some sort of an effect early in the year. By the end, though, as long as the quad injury isn't serious, you have to imagine it won't make much of a difference. If 7-foot-3 Knicks rookie project Kristaps Porzingis doesn’t return to practice Thursday, the chances of him missing half of the Knicks’ six preseason games become very real. Porzingis sat out Wednesday’s practice after being held out of Monday’s exhibition with a upper quadriceps strain. Coach Derek Fisher said if Porzingis is too sore to return to practice Thursday, he probably would have to sit out the back-to-back against the Celtics on Friday and at Charlotte on Saturday. That would make three games missed for the player who most needs the experience of NBA play before the regular season begins.